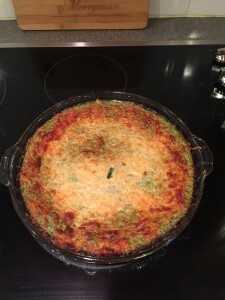 Meatless Monday, Spinach Pie, Recipe, Easy, 5 Ingredients! !, Delaware Beaches, Southern Delaware Eats! Starting a diet on Monday…resolutions usually start on Monday, not in the middle of the week, right? Monday is a fresh start for most of us. Not eating meat on Monday, apparently, is not a new concept. There is also Wheatless Wednesday. The awareness of Meatless Monday was reintroduced as a public health awareness campaign. It has taken off more so since 2003, with many restaurants offering Meatless Monday dishes. In our homes this is a concept easily adopted as 1, 2 3. We need it today because after all the eating on Thanksgiving….some of us started before that, LOL. This recipe for Spinach Pie was given to me by my cousins in Puerto Rico. 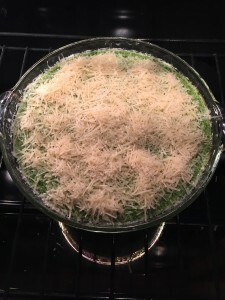 It is one of those recipes that is good, only 5 ingredients, and you can serve it for breakfast, lunch or dinner….adding or topping it with whatever comes to mind to make it your own. I hope you like it. Pre heat oven to 350 degrees. Grease lightly a pie dish. Let spinach defrost and squeeze it to get all the water out. While the spinach is defrosting take the cream cheese out of the refrigerator. You want it a bit soft. 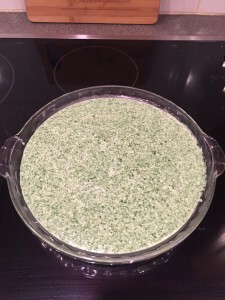 In a blender put eggs, spinach and cream cheese. Add salt and pepper to taste. I usually just add the pepper. Blend. Pour into the pie dish. Place in the oven for 10 minutes, then sprinkle Parmesan cheese on top to cover. The cheese will make a crust and will add taste to the pie. It will take probably another 20 minutes to be ready. Test it. It should have a nice rich, and brown crust. Take it out of the oven, slice, and enjoy!! Note: If you want it to be gluten free, please grate the Parmesan cheese yourself. 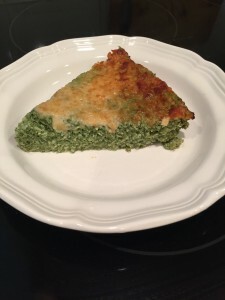 Comments Off on Meatless Monday, Spinach Pie, Recipe, Easy, 5 Ingredients! !, Delaware Beaches, Southern Delaware Eats!